A potent storm in the Gulf of Alaska (Link to surface map) is allowing high clouds to spread inland over much of the west coast of the United States. 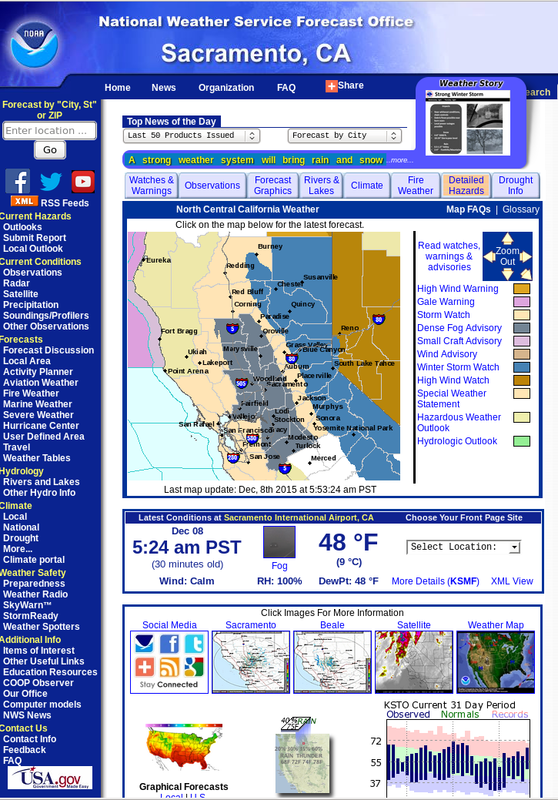 Dense fog has formed underneath that cloud deck in the California’s Central Valley, and advisories have been issued (Scroll down to see the screen-grab of the NWS Sacramento Office Website). How can satellite products be used to detect such a fog that is hidden by high clouds? The toggle below shows the GOES-15 Brightness Temperature Difference fields (with a pattern characteristic of mostly high (ice) clouds with a few breaks in the high cloud allowing the satellite to view lower water-based clouds) and the GOES-R IFR Probability field. IFR Probability is correctly alerting any forecaster to the probability that IFR conditions are occurring in the Central Valley. IFR Probability fuses information from the Satellite (not particularly helpful in this case) and information from the Rapid Refresh Model predictions of low-level saturation. The Rapid Refresh is correctly diagnosing the presence of saturation, and IFR Probabilities are enhanced over the Central Valley. This entry was posted in California, Multiple Cloud Layers on December 8, 2015 by Scott Lindstrom.